Liathach is one of the finest mountains in Scotland. The south face forms an imposing wall of sandstone tiers and vegetated terraces above the road in Glen Torridon. After a thaw, it can almost be stripped bare in the sunshine, but the north facing corries can still contain snow and ice, so don't be put off! The best option is to park at the Coire Dubh car park (NG 957 568), and follow the excellent path up the glen to the watershed. If you have reached the point where the path forks (the left fork heads west down the glen between Liathach and Beinn Dearg - the right fork skirts the base of Sail Mhor and ends up in Coire Mhic Fhearchair on Beinn Eighe), then you have gone a little too far. From the highpoint of the path, it's rough ground into either corrie. If you want to link descents, but also want to maintain height, the traverse of the ridge between the 2 corries presents minimal difficulty, but there is one exposed section of rocky ridge above Coire Dubh Beag when heading for the point 983m. Coire Dubh Beag is the easternmost of the corries, and contains one obvious gully line tucked up on the left hand side as you approach from below. This is Access Gully. 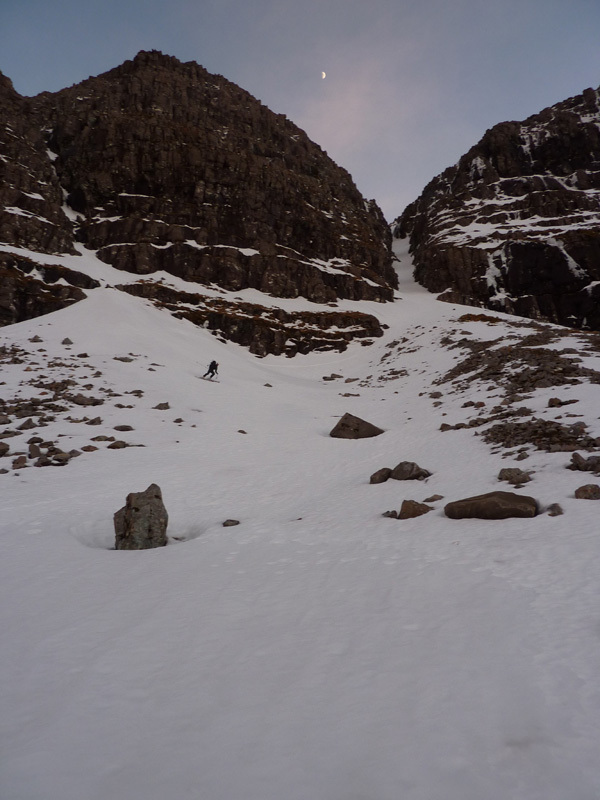 Coire Dubh Mor also has one obvious gully line in the backwall, the unusually named "Way Up". Between the corries is a large buttress that contains some gully lines. Closest to the entranct to Coire Dubh Beag is the narrow, slightly curving gully of "Hillwalk". Normally a Grade II climb, it can bank out to Grade I. It's potentially possible, but would be very narrow! To it's right (west) is another obvious gully line, with a steep right wall (climbers right). This is West Gully, a Grade I. I have climbed this some time ago, and at the time, it contained a short section of easy angled ice, but I am fairly sure it will be OK in the right conditions for a descent. The large corrie to the West of Coire Dubh Mor (Coire na Caime) looks to contain many skiable lines, with several Grade I gullies, and big steep slopes! 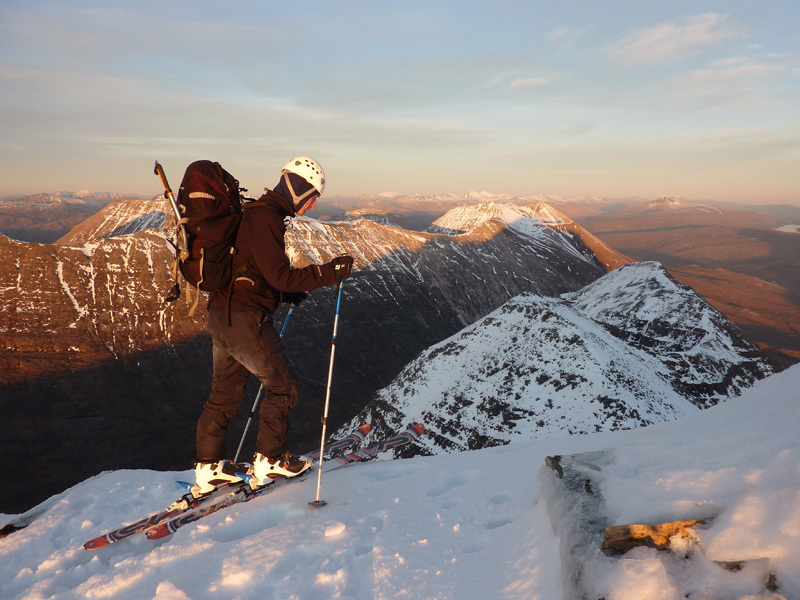 There is one relevant Scottish Avalanche Information Service forecast for Liathach: Coire Dubh Beag and Coire Dubh Mor. Access Gully is the obvious deep gully tucked up into the lefthand side of Coire Dubh Beag. Initially hidden from view on the approach, it becomes obvious as you near the corrie. It is narrow, particularly when lean. 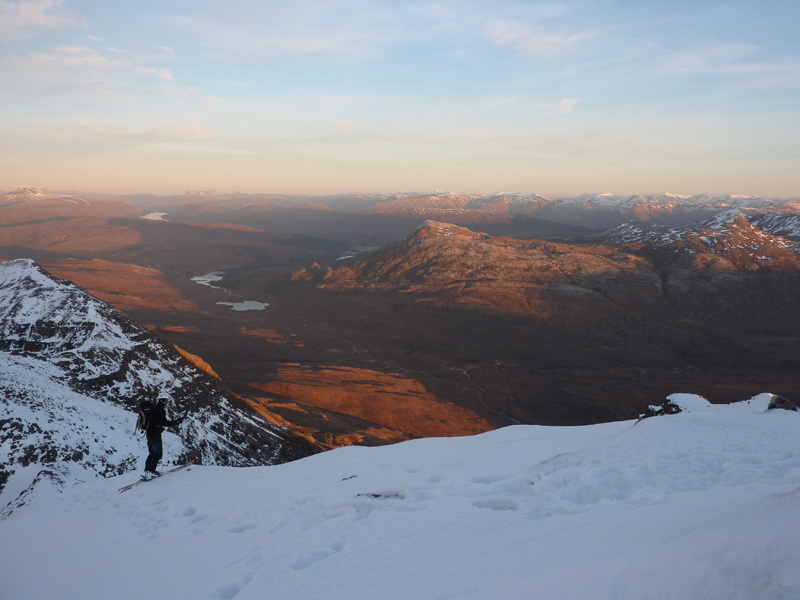 The top of the gully is at a narrow section of ridge, with a view straight down to the Glen Torridon about 800m below on the other side. The entrance is easiest on skiers right. "Way Up" is an unusual name for a gully, particularly when it is to be used as a way down for the purposes of this activity! 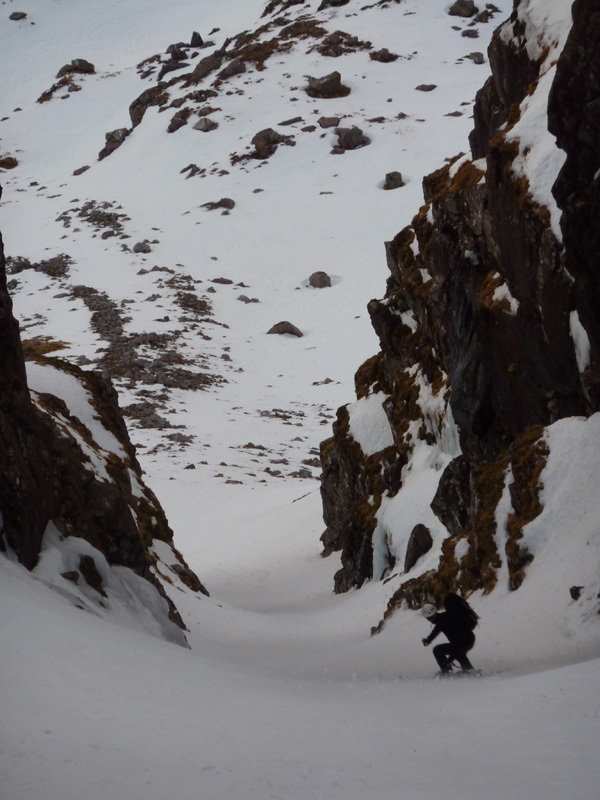 It's a strong line through some superb scenery in Coire Dubh Mor, and is well worth the effort of getting to it. It is the obvious gully line marked on the OS 1:50000 maps between point 983m and Spidean a' Choire Leith. It is possible to ski from the summit of Spidean a' Choire Leith down the fine ridge to the start of "Way Up" in the right conditions, providing a superb exposed descent followed by a deep gully. You may need to make small detours onto the south side of the ridge to avoid rocks at the top. Traverse round a rocky nose at the end of the ridge, and you will find yourself at the top of "Way Up"
After a thaw, the gully can be narrow in places, and the lower section can contain a lot of ice debris that has fallen from the cliffs. In lean conditions, it may be possible to descend the scree fan on the left hand side. The descent is reasonably uniform, with a slightly steeper section where the gully narrows below the upper slopes of the gully. Notes: Reasonably uniform slope, with no steep sections.